With an all-new model looming on the horizon, 2013 represents the end of the current generation Nissan Rogue. Despite its age, the Nissan Rogue is the only compact SUV to include a gearless CVT transmission as standard fare, and its tech-laden cabin offers innovative features like an available 360-degree Around View Monitor. It is a reliable crossover SUV that will keep you safe if the worst thing on the road were to happen. I like the fact that my car is reliable, and it has a diverse number of features. Also, I owned a 2012 Rogue before this one, and they're very similar cars. I lost the 2012 due to being in a car crash where it was totaled. To this day I believe I was able to walk away from that crash unharmed because of the many safety features of the car. I wish my vehicle sound system would integrate better with Android phones. When I plug my phone into a USB outlet, it will charge the phone, but that's it. Media doesn't connect. I have to use the AUX setting to listen to music, and manage it with my phone instead of the radio/steering wheel controls. The car also has an issue with the paint peeling on the front by the windshield. This is a problem seeing as the car is from 2013 and there should be no rusting in a car less than 10 years old that is taken care of. It's very basic, but not a bad midsize for the price. At first sight, I loved the 2013 Nissan Rogue. I had two kids under two, and I needed more room than my old car could offer. The back seat is fairly roomy, though it could be bigger. The front is just okay, in my honest opinion. The storage space leaves much to be desired, and the floors don't seem all that big. It's almost uncomfortable to have anything at your feet while riding. The stereo system works, but it's not impressive and very old looking. The trunk is probably the best part. Plenty of space, and if necessary the seats fold down. We were able to transport a dishwasher with the seats folded down. 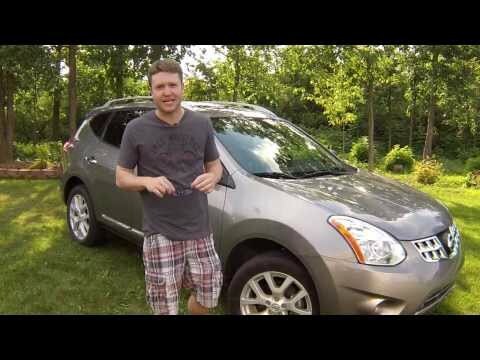 Overall, the Nissan Rogue is good if you're just looking for a midsize with the basics. I'm no car expert by any means, but I have seen older models of other makes with much better features and better prices. Nissan cute reliable and SUV feel. I purchased this car back when I was living in Pennsylvania for the fact that it had all wheel drive and I am a health care worker. When I got it the price of the car had me sold. After own this car for two years I have had little to no issues with it. I currently live in north Carolina and my family is still back home in Pennsylvania so I travel home often. It is the perfect size as well it is not such a large SUV but it still has the SUV feel to the car. The car is also fantastic on gas and gives you more of a sedan feel as you fill up your gas tank and are driving around. When I am due for a new car I will most likely get a newer version of this car that is how pleased I am with it!